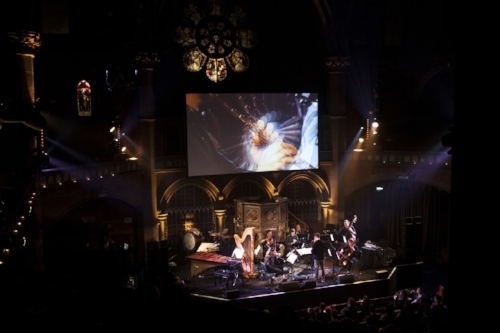 about the upcoming two-day festival, organ reframed, at Union Chapel, London. There is a lot happening at the festival itself - Friday 12th and Saturday 13th, 17:00, Spitfire Audio Composer Insights, £5; Friday 12th, 18:30, Visions in Meditation, tickets from £8.50; Saturday 13th, 12 noon, Daylight Music, pay-what-you-can; Saturday 13th, 18:30, Éliane Radigue and Hildur Guðnadóttir, tickets from £8.50; Friday 12th and Saturday 13th, Exhale, free for attendees to all Organ Reframed events – and singer talks about what we can expect; how she got involved and why she took to the organ. I ask whether the organ itself is becoming more popular and what advice she would give to anyone wanting to take the instrument up. Singer discusses her start in music and how her work has changed through the years – she reveals whether organ reframed will be an annual festival. Hi, Claire. How are you? How has your week been? Hi. I’m great, thank you! I’m just busy busy getting ready for organ reframed at Union Chapel in a few weeks’ time. It’s all go but hugely exciting to be pulling it all together. For those new to your music and career; can you introduce yourself, please? Sure! My name is Claire M Singer. I’m from Aberdeenshire in Scotland but have been living in London for the past sixteen years (I moved here to study music at Goldsmiths). I compose, perform and produce acoustic and electronic music; I create audio-visual work and installations but, more recently, I have been focusing on composing and performing organ, cello and electronics. I have released two albums, Solas and Fairge, on Touch and my most-recent project has been writing the music for Annabel Jankel’s film, Tell It to the Bees, which has just premiered at the Toronto International Film Festival. I’m also music director of the organ at Union Chapel in London and I started an experimental organ festival in 2016 called organ reframed which is about to happen for the third time on October 12th-13th. I am interested by your start in music. What inspired the 2016 release, Solas, and how did you approach recording of it? I started learning cello at the age of seven and piano at eleven and, from a very early age, I much preferred to sit and write my own melodies on the cello and, later, on the piano rather than play the music my teacher had given me. I then started playing in bands from the age of thirteen (first on keyboards and later adding my cello and accordion) and, when I got my own Roland keyboard E-300 - which introduced me to multi-track recording -, my compositions expanded quite dramatically into multi-instrumental works and that was it, I was hooked. I never really wrote the notes down on manuscript: it was always recording the piano or cello onto tape or recording on to my Roland floppy disk. This approach is what led me to studio composition at university. I liked that you could instantly hear your composition come to life. As I was playing classically on the cello, but also playing in the band, my writing very much took influence from both styles and is probably why my music today straddles the Classical, Electronic and Contemporary fields. I started playing organ when I joined Union Chapel as music director of the organ in 2012. I have been composing for organ for about twelve years but the early pieces were written for another organist to play. Since I had keys to one of the most beautiful organs in the world (Father Henry Willis, 1877), I used to sit for hours on end and experiment. I’ve never had an organ lesson but I developed my own way of playing and slowly reduced the amount of electronics I was using. I experiment a lot with the mechanical stop action, which basically lets you precisely control how much wind enters the pipe. Over the years, I have learnt every single incremental sound you can make on the UC organ and that’s how I developed pieces like The Molendinar (on my first release, Solas). I have had many people ask me over the years what electronics I am using in the piece but it’s solo organ and everything is played in one take. Solas features my organ, cello and electronic work which I wrote at the Chapel and also some earlier works (electronic and solo cello). It’s basically a collection of my work spanning fifteen years! As a composer and artist; how do you feel your work has evolved and changed since the start? I think my work has naturally evolved through time from drawing on various creative experiences - playing in bands and orchestras; studying composition at university - and a major turning point for me was when I started playing the organ. This ultimately developed my voice to where it is now. However, I think if you listened to one of my first-ever compositions you would still be able to tell that it is me. I feel like I’ve always had the same voice: it’s just constantly evolving as I have new creative experiences and still there is so much more to explore! Was there a particular moment/artist that got you into music? Were you always curious when it came to sound? Probably the most pivotal moment was when I started playing recorder in primary school which was soon followed by learning to play cello. It felt really natural to me and it was at that point I realised I could play by ear. Tell me about the festival, organ reframed, and how it came together. What can we expect to see from it? The idea of the festival has been a long time coming since I wrote my first organ piece and wanted to share the secret of how amazing the organ is - but it didn’t come into fruition until October 2016. The first three years of my time as music director of the organ at Union Chapel was transitioning the organ from its full restoration into developing a program of concerts and educational workshops around it. This three-year program was called the Organ Project which was funded by the Heritage Lottery Fund along with the full restoration of the organ. The Project gave me a chance to test the waters with different ideas and develop a regular organ concert presence at the chapel of all different genres. After completion in 2016, I felt ready to finally consolidate these ideas into a festival and organ reframed was born. The organ has one of the largest repertoires and has a strong Classical concert organ scene and that is equally important. In my opinion, we should embrace its historic repertoire and also help it to grow. There aren’t many contemporary composers writing for the organ as access can be tricky; most organs are in churches so you need to know someone with a key! In order to really explore and write innovative music you need time with the instrument. The main aim of organ reframed is to commission artists and composers to write new works; to allow them time on the organ to develop ideas and ultimately help develop the organ repertoire and show that this is an instrument that is very much at the forefront of new music today. 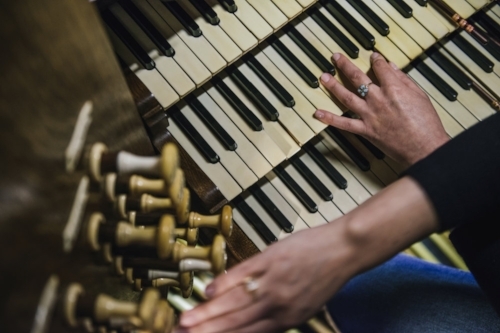 To have the opportunity to build on the organ’s rich history and bring it to the attention of a new generation of artists feels hugely important. This year, on Friday 12th, we have special screening of Visions in Meditation by Stan Brakhage with new works composed and performed by Philip Jeck, Sarah Davachi and Darkstar plus James McVinnie and London Contemporary Orchestra. On Saturday, Daylight Music - a fantastic regular lunchtime concert at Union Chapel - will be producing an organ reframed special with Terry Edwards, Seamus Beaghen; Douglas Dare and Deerful and, in the evening, we have new commissions from Éliane Radigue and Hildur Guðnadóttir performed by Frédéric Blondy, Hildur Guðnadóttir; James McVinnie and the London Contemporary Orchestra. Plus, a special documentary on Éliane working on her piece in Paris. Throughout the weekend, we have a new sound installation by Kathy Hinde and Spitfire Audio Composer Insight with Dario Marianelli and Michael Price before the two evening shows. All work has been commissioned and created on our organ for the festival. This is a unique festival that celebrates the relevance of organ. Do you feel it has played a huge role in historical culture and music? The main aim of organ reframed is to contribute to the development of the wonderful existing organ repertoire by commissioning new works by contemporary composers/artists and encourage them to take the time to explore; take risks and create truly innovative work. I think the organ is having a bit of a moment in the contemporary/experimental music world and there is a definitely a fresh approach forming towards the instrument - and organ reframed is making a contribution towards that growth but it’s great to see projects happening all over the world. This is definitely sparking the repertoire to grow in many different directions, like with other instruments but just on a lesser scale as access is still tricky. Is there any advice you would give to someone tackling the instrument who needs guidance? As I came to the organ in a different way to most (no formal training), I’m perhaps not the best person to ask! As a musician and composer I would say, and this goes for any instrument, the best thing is to spend as much time as possible exploring, practicing and also recording yourself playing so you can listen and learn how to develop your technique. Do you think the festival will be an annual thing? How far ahead are you looking? I hope so! We are now in year-three. It’s always tricky as we are reliant on arts funding but I won’t give up without a fight! (Smiles). You are the recipient of the Oram Awards. What was that like? What was your reaction? I felt hugely honoured to have my work and practice endorsed by the PRS Foundation and the New BBC Radiophonic Workshop by receiving an Oram Award. It was a huge surprise and it’s such a wonderful award celebrating creative women. The award also profoundly resonated with me having studied in the EMS (Electronic Music Studios), Goldsmiths who played a key part in putting together the Daphne Oram Collection. Having composed music for the film, Tell It to the Bees; how do you feel film composition varied compared to studio/personal music? Do you approach it with a different mindset? Tell It to the Bees is the first film I have worked on and probably the steepest learning curve of my entire career to date, but incredibly exciting and fun! The score is a mix of cello, organ; electronics and also orchestral from the brilliant London Contemporary Orchestra. It’s definitely a different beast writing for film as opposed to my own album material as you have to learn to hold back and take on more of a supportive role to the picture. I had to learn this all pretty quickly but luckily I had an extremely supportive director who is very passionate about music so she really pushed me, which was hard but the best way to learn. Also, writing short cues was at first a challenge! (My own album material spans from seven-twenty-five minutes!) My style/voice didn't change but the thing that may surprise people is the orchestral cues. I haven’t ever previously released any of my orchestral compositions which are faster moving than my organ works. It was really fun to write notes on paper (or Sibelius) and also to bring all of my sound palettes together in one score. Will there be more material and music from you next year do you think? I’m ready to get cracking on my third album after the festival. (Smiles). A more-recent favourite music memory is from last year’s organ reframed when Low wrote an extensive work for our organ. I’ve been a huge fan of the band for a very long time and it was truly magical what they created. It was especially exciting to then travel to Amsterdam and open for them at Westerkerk on their beautiful organ. Definitely a very special one for the memory bank. Do you find much time to relax away from music? How do you unwind? I love going home to Scotland and it’s hugely important to me as it’s the only place I seem to be able to re-set. Walking in the hills, swimming in lochs…it’s good for the soul! FEATURE: The Devil Makes Work for Idol Hands: Is Music Following Hollywood into a Dark Pit?